For other .22 caliber variants, see .22 (disambiguation). The .22 Winchester Magnum Rimfire, also called .22 WMR, .22 Magnum, .22 WMRF, .22 MRF, or .22 Mag, is a rimfire cartridge. Originally loaded with a bullet weight of 40 grains (2.6 g) delivering velocities in the 2,000 feet per second (610 m/s) range from a rifle barrel, .22 WMR is now loaded with bullet weights ranging from 50 grains (3.2 g) at 1,530 feet per second (470 m/s) to 30 grains (1.9 g) at 2,200 feet per second (670 m/s). Compared to the faster but lighter .17 HMR, the .22 WMR impacts targets with higher kinetic energy within its effective range, albeit with a less flat-shooting bullet arc. The .22 WMR was introduced in 1959 by Winchester, but was not used by Winchester until the Winchester Model 61 slide rifle could be chambered for it in 1960. The first rifle to be offered in the new chambering was the Marlin Model 57M Levermatic rifle in 1959, because its design was easily modified to accept the more powerful cartridge. By the time of the introduction of the Winchester 61, Smith & Wesson and Ruger had revolvers for it, and Savage had come out with the Model 24 and since late 2012, the model 42, a more modern update than the 24, a .22/.410 rifle/shotgun combination gun. It was the only successful rimfire cartridge introduced in the 20th century. The .22 WMR uses a larger case than the more popular .22 Long Rifle, both in diameter and length. The .22 WMR case is a lengthened version of the older .22 WRF. In the most common modern loadings, the combination of more powder and higher sustained pressures gives velocities of 1,875 feet per second (572 m/s) from a rifle using a 40-grain (2.6 g) bullet, and 1,500 feet per second (460 m/s) from a handgun. Because of its larger size, a .22 WMR round will not fit into the chamber of a .22 LR firearm. It is dangerous to chamber .22 LR rounds in a .22 WMR firearm. Doing so can result in injury from high pressure hot gas leaking around the LR case, which is too small for a .22 WMR chamber. The .22 WMR uses bullets comparable in weight to the .22 Long Rifle, but is considerably faster, it shoots flatter and farther and hits harder at all ranges. The 40-grain (2.6 g) .22 WMR at 100 yards (91 m) still has 50% more kinetic energy than a 40-grain (2.6 g) .22 LR at the muzzle, which provides improved penetration and more reliable expansion at longer ranges with expanding bullets. If sighted in for maximum point blank range on a 3-inch (76 mm) high target, the 40-grain (2.6 g) .22 WMR has an effective range of nearly 125 yards (114 m). This makes the .22 WMR an effective short to medium range varmint rifle and hunting rifle cartridge. The .22 WMR can effectively kill small game such as rabbits, hares, groundhogs, prairie dogs, foxes, raccoons, and coyotes. The relatively quiet report and negligible recoil also make it a very pleasant target and plinking round to shoot for extended periods. It first appeared in the Marlin Model 57M Levermatic carbine in 1959, which was followed by the .22 WMR over .410 gauge Savage Model 24 combination gun, followed by Winchester's own Model 61 pump-action rifle and Model 255 lever-action rifle. The Chiappa Double Badger combination gun also comes with a .22 WMR over .410 gauge option. The Springfield Armory M6 Scout is also made in .22 Magnum over .410 gauge. The Chiappa M6 Survival Gun is similar combination gun that comes with a 12 gauge or 20 gauge shotgun barrel over a .22 Magnum barrel. A number of single-shot and repeating rifles were offered in .22 WMR. The .22 WMR operates at pressures beyond what normal blowback actions typically handle, but the self-loading Jefferson Model 159 was introduced for the cartridge. Until the 1990s, most .22 WMR firearms were bolt-action rifles. In 1977-1985 Harrington & Richardson produced the first American-made semi-automatic .22 WMR. In the 1990s semi-automatic .22 WMR rifles were also introduced by Ruger (10/22) and Marlin, and are currently produced by Remington (Model 597) and Tanfoglio Appeal Rifle as well as the Excel Arms Accelerator Rifle and Savage arms A22 magnum. Revolvers in .22 WMR are made by Smith & Wesson, Colt, Taurus, North American Arms, Heritage Arms, and Sturm Ruger. Semi-automatic pistols for this cartridge are (or were) produced by Kel-Tec, Grendel and AMT, the latter two now defunct (AMT has been since resurrected by High Standard). The Grendel, AMT and Kel-Tec designs used specially designed chambers with flutes or gas ports, designed to lubricate the long, thin cartridge with gases from the chamber, overcoming the Blish effect and allowing easy extraction of the cartridge. High-Standard produced various models and versions of their classic two-shot over/under derringer in both .22 WMR and .22 LR. The Marlin Model 25MG is a smooth bore, 8 shot, magazine-fed, .22 WMR, bolt-action shotgun manufactured by Marlin firearms Company. It was specifically designed to use snake shot, and marketed as a "Garden Gun" for use in dispatching small garden and farm pests. It has an effective range of about 15 yards when using snake shot. Based on earlier Marlin .22 caliber designs, the Garden Gun was equipped with a high-visibility front sight but no rear sight. The Argentine EDDA submachine gun uses the .22 WMR round. The .22 WMR is an enlarged, more powerful version of the much earlier .22 WRF. Despite frequent claims to the contrary, it cannot be safely used in any firearm except those specifically chambered for it. Even firearms chambered for the .22 WRF are not suitable; for one thing, the case lengths are different, and the fact that the cartridge fits into the chamber does not guarantee that using the wrong cartridge is either safe or effective. The .22 WMR was for a time the most powerful rimfire round available; it even outperformed the .22 WCF. It has since been eclipsed in velocity and overall kinetic energy by the .17 Winchester Super Magnum. Commonly available in retail stores, the selection and availability of the .22 WMR nevertheless do not match the popular .22 Long Rifle. Furthermore, .22 WMR is typically much more expensive than .22 LR per round, though it is comparable to .17 HMR, which is much more similar in overall performance, and is less expensive than .22 caliber centerfire ammunition. Because many of the rifles that are chambered for the .22 WMR have tubular magazines, the bullet noses generally are flat or at least blunt to allow smooth feeding and reduce damage to the bullet. 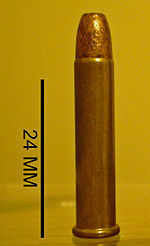 Although a pointed bullet in a rimfire cartridge will not contact the primer of the round in front of it (which is a hazard with centerfire cartridges in a tubular magazine), the manufacturer's stamp is in the middle of the base of a rimfire cartridge, and this may interfere with pointed metal bullets in a tube. However, Remington, CCI, and Hornady now produce bullet designs with 30 or 33-grain (2.1 g) polymer plastic ballistic tips that reduce the hazards of pointed ammunition in tubular magazines. Bullets for the .22 WMR are generally unlubricated lead with heavy copper plating, in either solid nose or hollow point style designed for small game hunting or pest control (varmint hunting). The limited selection of commercial ammunition for the .22 WMR has inspired specialist wildcatters to select the .22 WMR case for handloading high performance rimfire ammunition. Generally they load the wildcat cartridges with pointed bullets for the aerodynamic advantages, using the same bullets as those in .22 caliber centerfire cartridges. Though such bullets are generally heavier than standard .22 WMR, the sharp nose and tapered tail conserve energy better, delivering greater impact at longer ranges. Other wildcatters neck the .22 WMR down to smaller calibers, such as .20 (5 mm) and .17 (4.5 mm) or even smaller, in an attempt to get maximum velocity and the flattest possible trajectory. An example of such an experimental design is the Swedish 4.5×26mm MKR. ^ "XT 22 Magnum - 22 Magnum - Armscor International, Inc". armscor.com. Retrieved 15 April 2018. ^ "Federal Premium Ammunition - Rimfire". federalpremium.com. ^ "CCI Ammunition - Product Detail". www.cci-ammunition.com. ^ "Winchester Ammunition – Ballistics Calculator". ballisticscalculator.winchester.com. ^ a b c Barnes 1972, p.275, ".22 Winchester Magnum Rimfire". ^ Frank C. Barnes, ed. Stan Skinner. Cartridges of the World, 10th Ed. Krause Publications. ISBN 978-0-87349-605-6. ^ "CCI Ammunition - View All CCI Loads". www.cci-ammunition.com. ^ "Chiappa Firearms - M6". www.chiappafirearms.com. Retrieved 2018-10-28. ^ "Ruger 10/22 Magnum Serial Number History". Product History. Sturm, Ruger & Co., Inc. Retrieved 25 March 2013. ^ "Autoloading Rimfire Rifle - Model 597". Remington Guns. Remington Arms Company, LLC. Archived from the original on 2013-04-02. Retrieved 25 March 2013. ^ Slowik, Max (18 January 2012). "EAA's Latest Appeal: .22 Long Rifle and .22 Magnum Bullpup Carbines". Blog. Guns.com. Retrieved 25 March 2013. ^ CTD Mike (8 March 2012). "EAA to Import New .22 Tanfoglio "Appeal" Bullpup Carbine". The Shooters Log. Cheaper Than Dirt. Retrieved 25 March 2013. ^ "Taurus Revolver Manual" (PDF). Safety and Operation Manual. Taurus International. 25 February 2003. Archived from the original (PDF) on 2013-01-28. Retrieved 25 March 2013. ^ B. Gil Horman (24 March 2011). "North American Arms Mini Revolvers". American Rifleman. Retrieved 25 March 2013. The .22 Mag. models can be fitted with a second cylinder chambered in .22 Long Rifle, which makes practice and plinking inexpensive indeed. ^ "Smith & Wesson Air Lite 351PD (.22 Magnum)". Kansas Carry. Custom Digital Services, LLC. 2010. Archived from the original on 2011-03-08. Retrieved 25 March 2013. ^ NRA Staff (22 April 2011). "Heritage Mfg. Rough Rider Revolvers". American Rifleman. Archived from the original on 2013-04-14. Retrieved 25 March 2013. Chambered in .22 Long Rifle and .22 WMR, Heritage Mfg.’s nine-shot Rough Rider revolvers are now available in blued, black satin, silver satin and color case-hardened-style finishes. ^ Quinn, Jeff (5 January 2013). "Lightweight, Compact Ruger LCR 22 Magnum Pocket Revolver". GUNBlast.com. Retrieved 25 March 2013. I am glad that Ruger is including the 22 magnum along with the 22 LR, 38 Special Plus P, and 357 magnum chamberings in this handy little revolver. ^ B. Gil Horman (15 February 2011). "The Kel-Tec PMR-30". American Rifleman. Retrieved 25 March 2013. As a fan of the .22 Mag. cartridge, I am very pleased that Kel-Tec built a lightweight, high-capacity semi-auto that shows off what this neat little cartridge can do. ^ Eger, Chris (7 March 2013). "The Grendel Pistols: The forgotten polymers (and the birth of Kel-tec)". Guns.com. Retrieved 25 March 2013. With the use of polymers, the weight of this target pistol was kept down to 26 ounces when loaded with an impressive array of 30-rounds of rimfire magnums. ^ Kelly, Paco (9 August 2006). "Still Holding On: AMT's AutoMag II .22 Magnum Rimfire Auto". GUNBlast.com. Retrieved 25 March 2013. It wasn't very long ago that some very well-designed little .22 Magnum handguns were available from AMT (Arcadia Machine & Tool) of Irwindale, CA. ^ Quinn, Jeff (27 November 2006). "High Standard Brings Back the AMT Automag II .22 Magnum Pistol". GUNBlast.com. Retrieved 25 March 2013. After being out of production for several years, High Standard Manufacturing is now producing the Automag II pistol that was previously produced by AMT in Irwindale, California and Galena Industries in Sturgis, South Dakota. ^ "AMT AutoMag". Archived from the original on June 16, 2009. ^ "High Standard Derringer". Guns in Movies, TV and Video Games. Internet Movie Firearms Database. Retrieved 25 March 2013. ^ a b Lermayer, Ralph M. (July 2010). "Evolution of the .22". GunHunter Magazine. Buckmasters Ltd. Retrieved 17 September 2016. … take a .22 rimfire smoothbore (like the Mossberg or Marlin’s Garden gun), and patterns will be surprisingly good out to 15 yards. ^ Rees, Clair (March 2000). "Marlin's 'Garden Gun' - Model 25MG". Guns Magazine. Archived from the original on 2014. Retrieved 17 September 2016. ^ Eger, Christopher (28 July 2013). "Marlin 25MG Garden Gun". Marlin Firearms Forum. Outdoor Hub LLC. Archived from the original on 2016-09-18. Retrieved 17 September 2016. ^ a b c Barnes 1972, p.275, ".22 Winchester Rimfire (WRF)"
^ Sparano, Vin (2000). The Complete Outdoors Encyclopedia. New York: St. Martin's Press. ISBN 978-0-312-26722-3. ^ "Remington Magnum Rimfire: 22 Win Mag PR22M1 33-grain AccuTip-V". Remington Arms Company, Inc. Archived from the original on 2008-05-30. Retrieved 2008-06-17. ^ "CCI: Varmint 0073 22 Magnum RF V-MAX 30-grain poly-tip". CCI. Archived from the original on 16 May 2008. Retrieved 2008-06-17. ^ "Hornady: 22 WMR 30-grain V-MAX". Hornady Manufacturing, Inc. Archived from the original on 2009-02-10. Retrieved 2008-06-17. Barnes, Frank C., ed. by John T. Amber. ".22 Winchester Magnum Rimfire", in Cartridges of the World, pp. 275. Northfield, IL: DBI Books, 1972. ISBN 978-0-695-80326-1. Wikimedia Commons has media related to .22 WMR.